Native of Pittsburgh, PA and recently relocated to Austin,TX, Bonnie has spent over a decade working on a variety of soundscapes and musical experiences for educational products, simulations and computer/video games as well as interactive experiences, and theme park attractions. 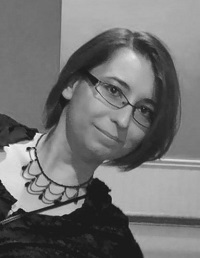 Virtual, augmented and mixed reality projects she has worked on include titles such as “I Expect You To Die” for Oculus Rift and Playstation VR, “Frostbound” for Google Daydream, “SuperChem” for HTC Vive, “Domino World” for Google Tango, “Annihilator” for Google Cardboard and “Water Bears” for HTC Vive. Notable titles on other platforms include “Aven Colony”, “HIVESWAP”, “World of Lexica”, “Daniel Tiger: Stop and Go Potty”, “Baker Street Experience” and “Pugmire”. She is the Artistic Director of “Evenings in Quarantine: The Zombie Opera“, Music Director of “Super Smash Opera“ and an arranger and vocalist for a plethora of video game tribute albums by record label The Materia Collective. As a voice actor, she can be heard in a variety of projects including: I Expect You To Die, Pugmire, Water Bears, and The Baker Street Experience. She is also a voice artist and the sound designer and composer of The Dracula Radioplay by Cryptic Canticles and an active arranger and vocalist for a plethora of video game tribute albums by The Materia Collective. She teaches at the Art Institute of Austin as an Adjunct Professor of Media/Audio. She has served on the boards and committees for a variety of organizations including the Great Lake Film Association, Parsec, Pittsburgh Savoyards, Game Audio Network Guild, IASIG, GANG Voice Actors Coalition, and the IGDA Virtual, Augmented, and Mixed Reality SIG. Video game judge for Spillprisen, IGF, and Indiecade, animation and script judge forGLFA, IGDA Boardgames Competition, andreviewer for Focal Press. She is an active, panelist, presenter, and mentor at variety of events events including but not limited to AES, MAGfest, GameSoundCon, Confluence, and GDC. Corey has been in the film industry for nearly a decade, mostly working behind the camera as a grip/electric and assistant camera. During this time, he found a passion for acting; appearing in short films and independent features. Though he did some voice work, his career path ultimately led him to work for QVC as a studio lighting designer, designing lighting for everything from the day-to-day live broadcast, to onlocation events, to musical performances by artists such as The Beach Boys and Barry Manilow. It was at QVC that Corey was reunited with his passion for acting and voiceover. When a recurring show required a voice talent, Corey stepped up to perform. Since then, he has trained and grown as a voice over talent, working in projects both commercially and creatively. He recently created his own voice over company, BlueRexVO. (www.bluerexvo.com) When he’s not in the booth or on set, he’s tinkering with his Subaru WRX out in the garage or attempting to learn a new language. Currently residing in Cincinnati, OH, Stephen originally hails from the arid foothills of Tucson, AZ (and still considers himself a “misplaced desert rat”), where he not only developed a passion for the outdoors and wildlife at a young age, but also received classical and jazz music training during his school years. He went on to receive a Bachelor of Science degree in zoology from the University of Oklahoma, and has worked for many years in zoo and aquarium settings, being fortunate enough to earn a living by combining his love of animals and his performing skills as a tour guide, animal handler, educator, and show presenter. Stephen is relatively new to the voice acting scene, but he has made an effort to dive into it wholeheartedly, learning as much as he can about the craft, and taking on narration and character roles in a variety of independent projects and short promotional spots. He has long been a lover of fantasy and animation, and developed a very discerning ear for detail early on, along with a talent for imitating sounds, accents, and different voice types. What he lacks in formal theatrical training, he makes up for with his diverse vocal range borne of decades of musical practice and mimicry, as well as giving life to the characters that he encountered in books, comics, old video games, and so on. Before beginning his foray into voice acting, Stephen started his adventures in audio as an instrumental musician with a focus on various world flutes, having acquired his first Native American style flute back in 2005. The collection has only grown since then, branching out to include other types of flutes, harmonicas, and percussion instruments, which he has used for live performances and studio recordings alike. As of 2018, Stephen has recorded and produced four albums of original & exotic instrumental music, which can be found here on his Bandcamp page. Listen for his flutes and drums in certain scenes of The Call of the Flame, as well as during the end credits! When he’s not in front of his microphone, Stephen can often be found upon the saddle of one of his bicycles, enjoying the company of his cat or his animal co-workers, sipping happily at a wide variety of teas, or cooking up something spicy in the kitchen. Fan of all things nerdy and self-proclaimed "King of useless trivia", Garry is the creator of Command Grab Productions, which produces fandubs, as well as original content such as comics, manga, and voice over production for businesses. He received his degree in Cyber-Security with a minor in East Asian studies. He is passionate about writing, and voice-over work and has been a part of various productions over the years. Software engineer by day, voice actor by night, snark full-time. Singer, gamer, cyclist with a luxurious beard. Now reachable via @XathienVO! 20 years old and live in Chattanooga, TN. Born and raised there, and has lived here all his life. First introduced to voice acting with, what else, cartoons! Specifically Looney Tunes and Mel Blanc's fantastic work in that. He found it amazing that one man did NEARLY ALL of those voices! As he grew older he was still very interested in cartoons and animation but wasn't so much focused on the idea of voice acting until about 17 when he realized that voice acting could be my dream job. The work can be hard at times but that is nothing when compared to the buzz he gets stepping up to the mic with script in hand and getting to really have fun with his work. Studied at Chattanooga State Community College for a bachelors Telecommunications where he used the skills in audio mixing and quality to make his audio sound better. "Kindness, professionalism and a sense of humor are the stepping stones to getting along, no matter who with." 22 years old, born and raised in Chicago, Illinois. He first indulged in voice acting and roleplay at a young age, and has ever since made it a hobby, and eventually an occupation. His hobbies include voice acting, singing, writing, and being a DM for Dungeons & Dragons. He is capable of an extremely wide range of voices and has been honing them his entire life. Project director's see him as very hard working, but also fun and humble co-worker. After discovering what he truly loved to do, he set out to make a name for himself in the Voice Acting business. Since he showed prowess in early 2018 for Voice Acting, he's gotten himself involved in a multitude of different projects. Jacob has voices in "Fallout: The Frontier" and "Fallout: A Brave New World", both very large Fallout: New Vegas total conversion mods. He has voiced characters in stop motion films, video games, as well as animatics, machinimas and comic dubs. Jacob's most notable inspirations are the renown Matthew Mercer and Troy Baker. He has learned one of the most effective ways of getting into character, and uses it to his full advantage. Losing yourself to be put in another's shoes, to feel, speak and act like them in every way. He hopes to continue his career in Voice acting for years to come, and to work hard enough to be able to create and play characters that people will remember and love. Hayden Ashley, aka Critikal Miss on the internet, has been acting on stage and in film for the better part of his life. Ever since he can remember, Hayden has had a passion for acting; whether it be from movies, animations, or games, he was hooked from the start. You can follow him more on his Twitter (@Critikal_Miss) where he posts about his latest projects. 18 years old, born in Luton, but living in Stockport, UK. Fighting her way into the film industry, with two and a half years of film and TV acting study. Going to cinemas ever since she was 1 year old, a passion was lit inside her and it never died. Always auditioning for school plays and projects. Her passion for acting in front of the camera developed to a passion behind it as well as she took up several media courses ranging from BTEC photography, screenwriting, camera work, video/audio editing, and marketing as well (currently followed on Twitter by inspirations like Leigh Whannell, Tobin Bell and Josh Stolberg). Her university work begins in September, and her 18 year long fantasy is slowly becoming a reality. Kurt is an aspiring filmmaker from the Mile High City (as evidenced by his beanies and love of flannel). Ever since he had a digital camera to animate Legos he's been chasing filmmaking dreams of impossible scale. But where there's a will, there's a low budget way (have you seen how much Legos cost these days!?). This led him on a path to discover Web Animation, Machinima, and Podcasting. His inspirations range from literature, film, and comics, with Brian K. Vaughn, Joss Whedon, C. Robert Cargill, and George R.R. Martin, being among his most influential writers. He studied at the Colorado Film School for two years and has produced web content since 2010 with his Halo machinima web-series "Theta". From here he doesn't know where he'll go. No matter what though, he will do it with friends at his side, and will never hear the odds of success [though he might acknowledge them in a non-commital fashion].